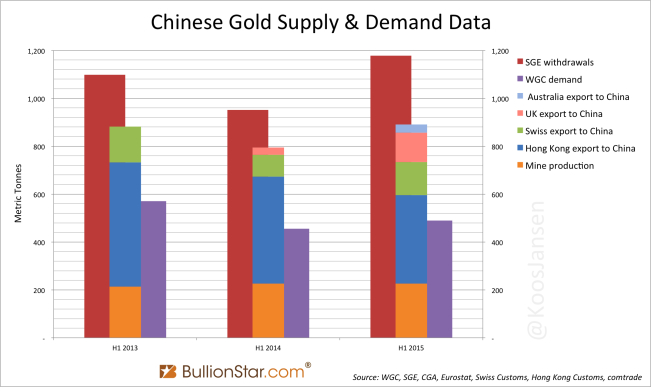 This post is part of the Chinese Gold Market Essentials series. Click here to go to an overview of all Chinese Gold Market Essentials for a comprehensive understanding of the largest physical gold market globally. This post was updated in 2017. In 2013 we’ve witnessed the inception of the Chinese gold ETF market. 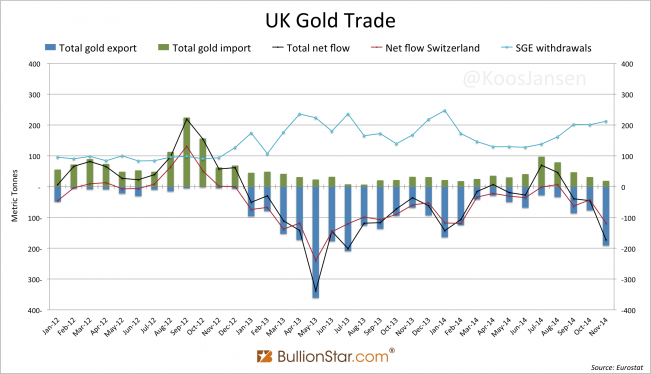 At first demand for the gold ETFs was neglectable, as investors mostly preferred to buy the physical gold directly at the Shanghai Gold Exchange (SGE) or buy jewelry or investment bars through retail channels. In 2016, however, there has been a major shift towards gold ETF demand in China. 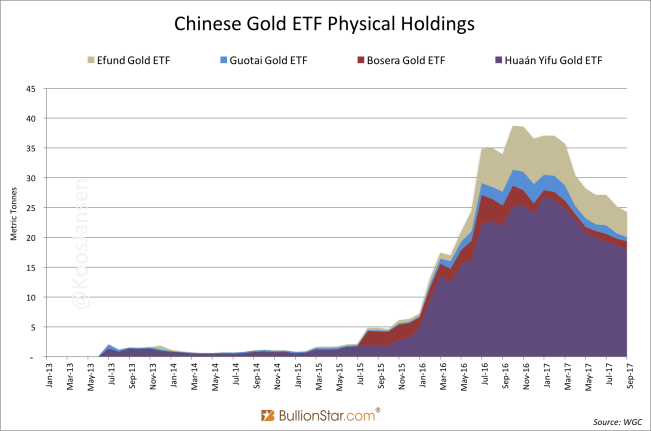 The physical holdings of Chinese gold ETFs have surged five-fold from 7 tonnes at the end of January 2016, to 35 tonnes at end of August 2016. The Huaán Yifu Gold ETF, which was holding 23 tonnes in August 2016, even entered the global top 15 list. Since 2016 total Chinese gold ETF holdings (all stored within SGE designated vaults) have dwindled to an aggregated 25 tonnes in September 2017. Exhibit 1. All physical holdings of Chinese gold ETFs are stored within SGE designated vaults. The interest in China’s gold ETF market was even mentioned by the World Gold Council in a Gold Demand Trends report. In this post, we’ll add some texture to China’s gold ETF market; how are the gold ETFs constructed and how can they be compared to the largest Western gold ETF, the SPDR Gold Trust. At this moment the market share of Chinese gold ETFs is small – within China as well as globally, but knowledge about the workings of these ETFs will be valuable if they acquire significant market share in the future. Kindly note, all mechanics and examples presented in this post are simplified. ETF is short for Exchange Traded Fund. ETFs trade like stocks and its price usually tracks an underlying asset or index. Like stocks, ETFs have a primary market and a secondary market. The secondary market is the stock exchange where most ETF investors trade. What makes ETFs special is the primary market where ETF shares are created and redeemed. Let us use the SPDR Gold Trust (symbol: GLD) to illustrate how the primary market works. Mainly through the creation and redemption process of shares, the GLD share price tracks the gold price. The Authorised Participants (the institutions which are authorised to create and redeem GLD shares, at this moment the Authorised Participants are Barclays Capital, Inc., Credit Suisse Securities (USA) LLC, Goldman Sachs & Co., Goldman Sachs Execution & Clearing, L.P., HSBC Securities (USA) Inc., P. Morgan Securities Inc., Merrill Lynch Professional Clearing Corp., Morgan Stanley & Co. LLC, RBC Capital Markets, LLC, Scotia Capital (USA) Inc., UBS Securities LLC and Virtu Financial BD LLC). Exhibit 2. 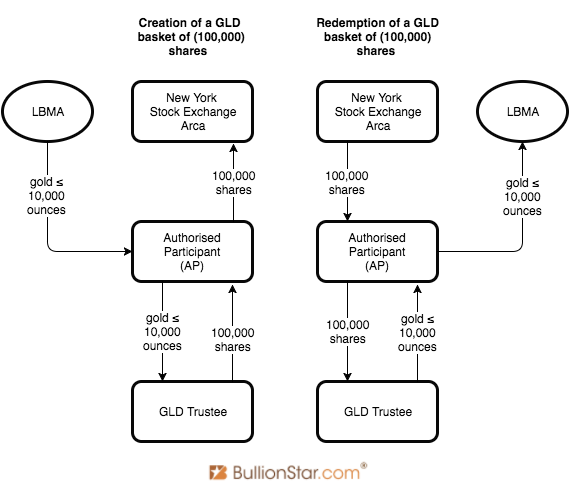 The (simplified) process of creation and redemption of GLD shares by an Authorised Participant through the Trustee. The redemption process works the other way round. If an AP wants to redeem GLD shares, it deposits 100,000 GLD shares at the Trust and subsequently the AP receives 10,000 ounces of gold. 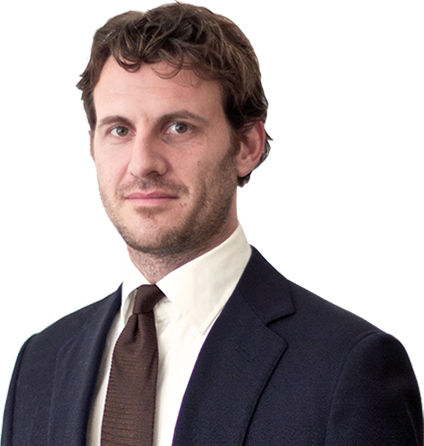 The purpose of APs creating and redeeming GLD shares is usually arbitrage. As previously mentioned the gold equivalent of 1 GLD share is roughly 0.1 ounce, nevertheless GLD shares and actual gold are traded in two different markets. As a consequence, the price of 1 GLD share can differ from the price of 0.1 ounce of gold. If the price of GLD and the price of gold diverge, this is where arbitrage comes into play for the APs. Accordingly, the arbitrage by APs through creation and redemption of shares contributes to GLD’s price tracking the gold price. Suppose (simplified), the price of 1 GLD share is $110 – caused by supply and demand for GLD shares at the NYSE Arca – while the price of 0.1 ounce of gold is $100 in the gold market. An AP can grasp this opportunity by buying (or first leasing) 10,000 ounces of gold to deposit in the GLD Trust account after which the Trustee will create 100,000 GLD shares for the AP. The new shares created are then sold by the AP on the stock market, which will cause the price of GLD to go down. The arbitrage opportunity will be used by APs until it’s closed. If the price of GLD shares is lower than the price of gold, the arbitrage opportunity works the other way around, APs can buy shares, redeem them for gold at the Trustee and sell the gold. In the aforementioned example trade when the AP (via the Trustee) created 100,000 GLD shares his investment was $10,000,000 (10,000 ounces at $100 per 0.1 ounce). The AP’s revenue was $11,000,000 (100,000 GLD shares worth $110 a piece). The AP’s profit in this exercise was $1,000,000. 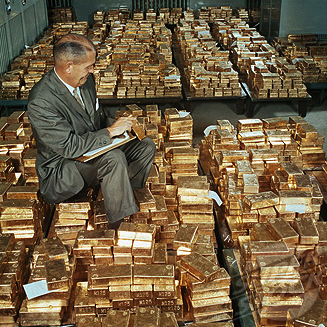 As readers can see from the example, the holdings of GLD were increased by 10,000 ounces of gold. 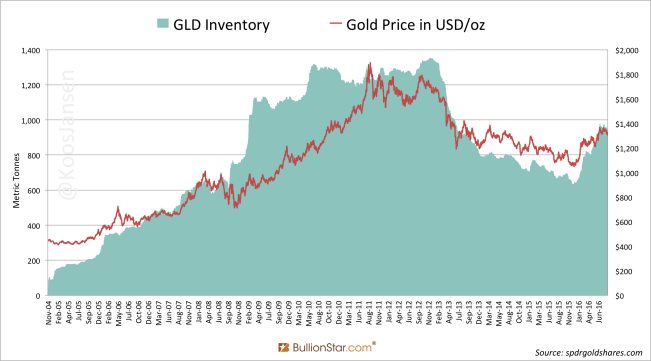 Almost every day the holdings of GLD vary and the change is often caused by arbitrage of APs. 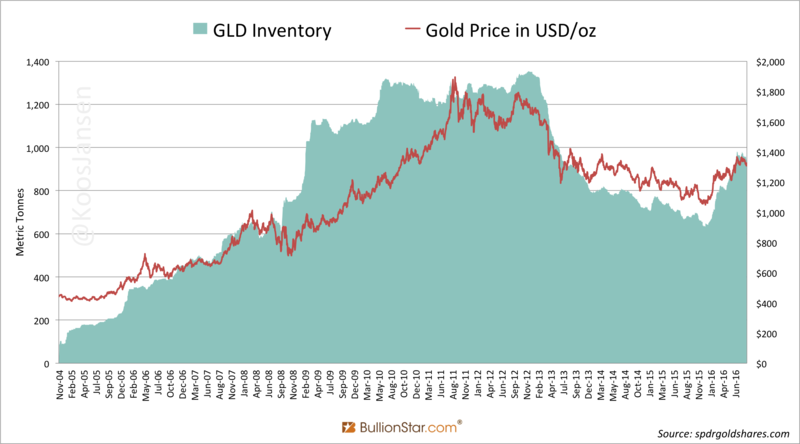 One theory is, when demand for GLD shares is strong (usually by Western investors) and the share price is trending higher than the price of the gold equivalent, the APs jump the arbitrage, create shares and GLD inventory swells. Then, if growth in GLD inventory correlates to a surging gold price (which can be observed in exhibit 3 below) we can speculate the gold bull market in part has been caused by Western investment demand in GLD. Now we have established the workings of the largest Western gold ETF, we will have a look at how the Chinese gold ETFs are constructed, and compare them to GLD. Below are the 4 Chinese gold ETFs currently in existence that we’ll discuss. In China every gold ETF share represents approximately 0.01 gram of gold. By creating or redeeming gold ETF shares (Chinese) APs receive or deliver a basket of 300,000 shares, which equals to 3Kg of gold. This threshold is much lower than that of GLD, of which a basket equals to 310Kg of gold. The gold acceptable for Chinese ETFs are the spot (physical and spot deferred) gold contracts listed on theSGE – for example Au99.99. Therefore, all the physical holdings of China’s gold ETFs are stored within SGE designated vaults. Moreover, there is a range of features that make China’s gold ETFs quite different from GLD. Unlike GLD, which only allows the use of gold to create shares, and only allows the use of shares to redeem gold, China’s gold ETFs also allow shares to be created and redeemed through cash in the primary market. An AP can present cash to the Fund Manager who handles the creation and redemption process for a Chinese gold ETF. The Fund Manager is comparable to the Trustee of GLD. 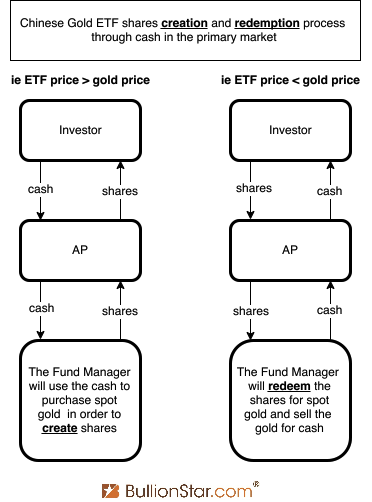 Thereby, through an AP individual investors can create or redeem gold ETF shares with cash as well. Suppose, a Chinese investor wants to arbitrage the difference between the price of a gold ETF and the price of gold. In this example the price of the gold ETF is higher than the price of gold, so the investor want use cash to create shares to sell on the stock market. The investor can present cash to an AP who in turn will create shares via the Fund Manager. The amount of cash used in this transaction to create shares is equal to the cash value of the spot gold contracts that are needed to create the shares without the use of cash. Vice versa, in case an investor wants to arbitrage the price of a gold ETF when it’s lower than the price of gold, the investor can present shares to an AP to redeem for cash. Exhibit 4. Creation and redemption process of Chinese gold ETF shares through cash. In China the APs can be securities firms and commercial banks. The securities firms are often not SGE members. Therefor, the number of APs that support gold ETF shares creation and redemption through cash is often larger than the number of those that support shares creation and redemption through spot gold contracts. For example, in the case of Efund Gold ETF, the fund has authorised 13 securities firms (APs) to process creation and redemption through cash, but only 2 banks (APs) to process creation and redemption through spot gold contracts (Industrial and Commercial Bank of China and Bank of Communications). Gold held in the Trust [GLD]’s allocated account is the property of the Trust and is not traded, leased or loaned under any circumstances. In China, the Fund Managers of the gold ETFs have more flexibility. The gold contracts that China’s gold ETFs hold include not only spot physical contracts like Au99.99 and Au99.95, but can also be spot deferred contracts like Au (T+D), and notable all these “spot contracts” may be leased (sometimes swapped) within the SGE system. Additionally, every Chinese gold ETF can invest 10% of its fund assets (5 % of net fund assets in case of Efund Gold ETF) in “other financial instruments” allowed by the China Securities Regulatory Commission (CSRC). The investment scope of the Fund [Efund Gold ETF] is liquid financial instruments, including gold physical contracts (including spot physical contracts, spot deferred contracts, etc), bonds, asset-backed securities, bond repos, bank deposits, money market instruments, and other financial instruments which laws, regulations or the CSRC allow the Fund to invest in the future (but these have to satisfy the relevant rules of the CSRC). If laws, regulations or regulatory institutions allow the Fund to invest in other instruments (including but not restricted to gold derivatives like forwards, futures, options and swaps), after necessary procedures, the Fund Manager will include them into the investment scope. The portfolio percentage: The fund asset invested in gold spot contracts is not lower than 95% of the net asset value of the Fund. All the 4 gold ETFs in China can participate in gold leasing. Some can participate in gold swaps and some can pledge the gold to borrow money. The Fund can do gold lease and pledge gold to borrow money. Effectively the Fund Manager of the Huaán Yifu Gold ETF can make money by, for example, leasing the fund’s assets. 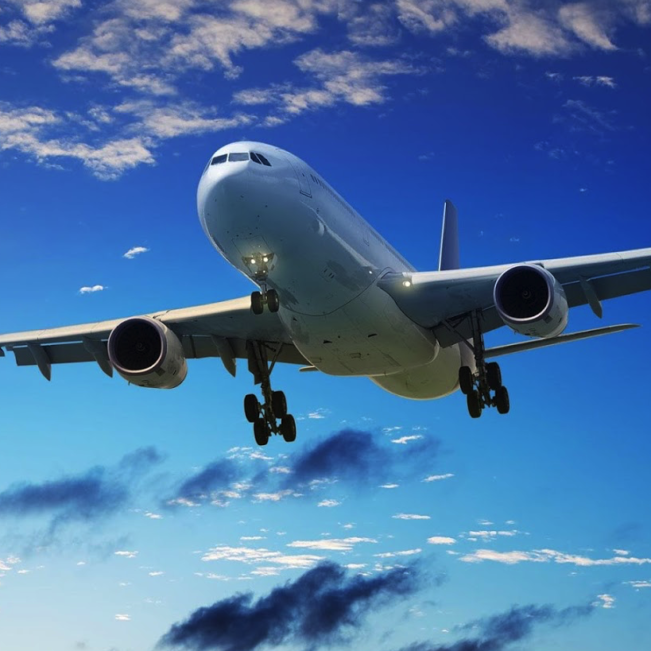 The Fund can do gold lease, gold swap and invest in gold spot deferred contracts, etc, in order to lower the operating expenses and lower tracking error. The Fund does margin trade only for the purpose of risk management and enhancement of the efficiency of the asset allocation. As a result, the Fund Managers of Chinese gold ETFs have significant flexibility in handling the fund assets. Please remember that all gold leasing, swapping, etc. has to be done within the SGE system and the gold cannot leave the SGE designated vaults. Article 4. Gold ETFs may not deposit physical gold into the [SGE] vault or withdraw physical gold from the [SGE] vault. Margin trade is only for the purpose of risk management and enhancement of the efficiency of the asset allocation. Exhibit 5. The bottom row shows the minimum percentages the Gold ETFs must invest in “spot contracts”, though some of this gold can be involved in leasing. The amount of gold represented by the Shares will continue to be reduced during the life of the Trust due to the sales of gold necessary to pay the Trust’s expenses irrespective of whether the trading price of the Shares rises or falls in response to changes in the price of gold. Each outstanding Share represents a fractional, undivided interest in the gold held by the Trust. The Trust does not generate any income and regularly sells gold to pay for its ongoing expenses. Therefore, the amount of gold represented by each Share has gradually declined over time. This is also true with respect to Shares that are issued in exchange for additional deposits of gold into the Trust, as the amount of gold required to create Shares proportionately reflects the amount of gold represented by the Shares outstanding at the time of creation. Assuming a constant gold price, the trading price of the Shares is expected to gradually decline relative to the price of gold as the amount of gold represented by the Shares gradually declines. On November 18, 2004, 1 GLD share exactly equaled 0.1 ounces of gold, but by now (September 2016) 1 GLD share equals 0.09542 ounces of gold, a decline of almost 5 % over the course of 12 years. This explains why currently the amount of ounces needed by an AP to create a basket of shares has become less than 10,000 ounces, and continues to decline. In China’s gold ETF market, although the gold represented by the ETF instruments also decline as with GLD, the share values are periodically re-adjusted to ensure the NAV per share remains (roughly) 0.01 gram of gold. Fund share re-calculation means the fund manager based on the necessity of the operation of the fund, under the premise that the total NAV is unchanged, adjusts the total fund shares outstanding and NAV per share. 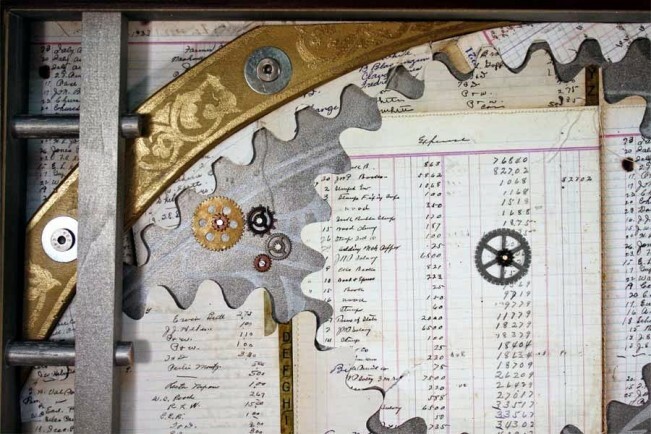 There is nothing complicated about the re-calculation. There are simply periodic adjustments when the Fund Manager sets the value of the shares (in yuan) higher because the gold content equivalent is elevated, from below 0.01 gram to 0.01 gram, whereby the Fund Manger “adjusts the total fund shares outstanding” downward. 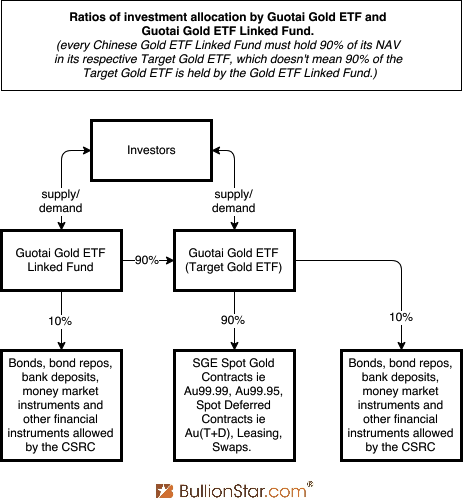 In China, every gold ETF is accompanied by a Linked Fund. The Linked Fund mainly invests in the Target Gold ETF as can be seen in the list below. The Linked Fund is usually a common open-ended mutual fund. 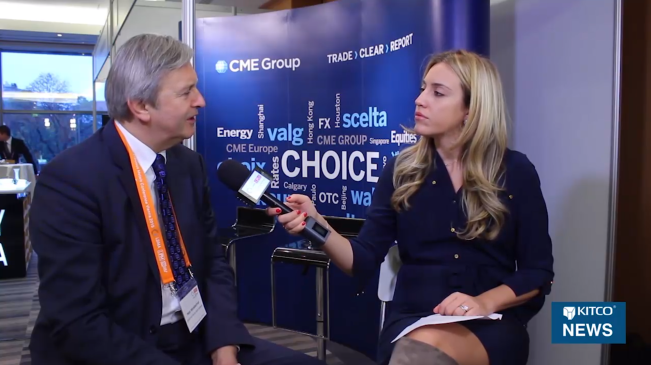 While 90 % of the assets under management of the Linked Fund must be invested in its Target Gold ETF, the Fund Manager still has some room for managing the remaining 10%. The Fund mainly invests in Bosera Gold Exchange Open-Ended Securities Investment Fund, gold contracts listed on the Shanghai Gold Exchange, gold futures contracts listed on the Shanghai Futures Exchange, bonds and other financial instruments which the CSRC allows the fund to invest, like securities lending and borrowing, gold lease, etc. For more clarity I’ve drawn a graph to illustrate the ratios of investment allocation by the Guotai Gold ETF and the Guotai Gold ETF-linked Fund. Although, at this stage it’s not completely clear to me what would be the benefit for investors to invest in the Linked Fund, as opposed to the Target Gold ETF. 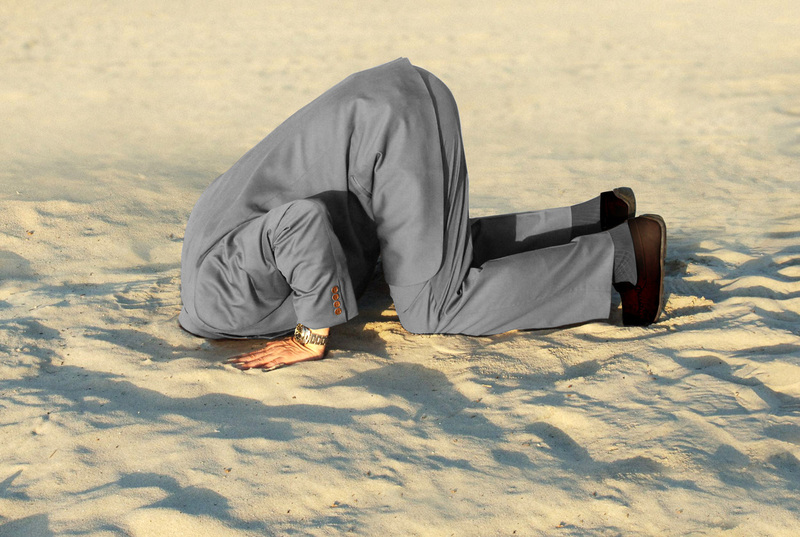 Under the Trust Indenture, Shareholders have no voting rights, except in the following limited circumstances: (i) shareholders holding at least 66.66% of the Shares outstanding may vote to remove the Trustee; (ii) the Trustee may terminate the Trust upon the agreement of Shareholders owning at least 66.66% of the outstanding Shares; and (iii) certain amendments to the Trust Indenture require 51% or unanimous consent of the Shareholders. 11. Other items that are required by laws, regulations, the fund contract or the requirements of the CSRC to hold the fund share holders’ meeting. 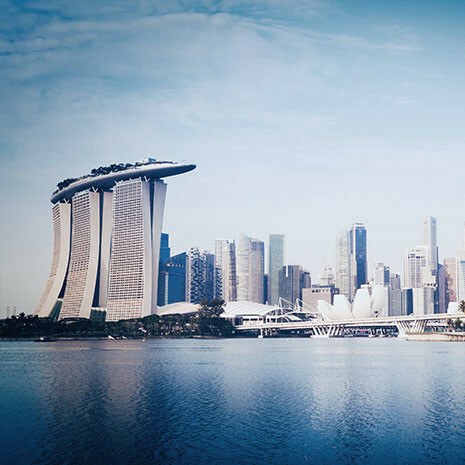 The fund shareholders of the linked fund of this fund can attend or send representatives to attend the fund shareholders’ meeting and participate in voting, based on the share holding of the linked fund. The equivalent number of fund shares with voting rights and correspondent votes are: the product of the total shares of this fund held by the linked fund multiplied by the linked fund shares held by the respective link fund share holder as a percentage of the total linked fund shares outstanding. The result of the calculation is rounded to the nearest whole number. Ironically, to me there seems to be more democracy and openness in China’s gold ETFs than in GLD. On the other hand, Chinese gold ETFs have a fundamentally different foundation, a hybrid design I would say. China’s gold ETF market was erected in 2013 and is still evolving. In the future, there may be more complex gold ETF related financial structures that have a big impact on China’s overall gold market. I shall follow it closely.